As an organization, our investment is to promote, protect, and preserve your business or organization. 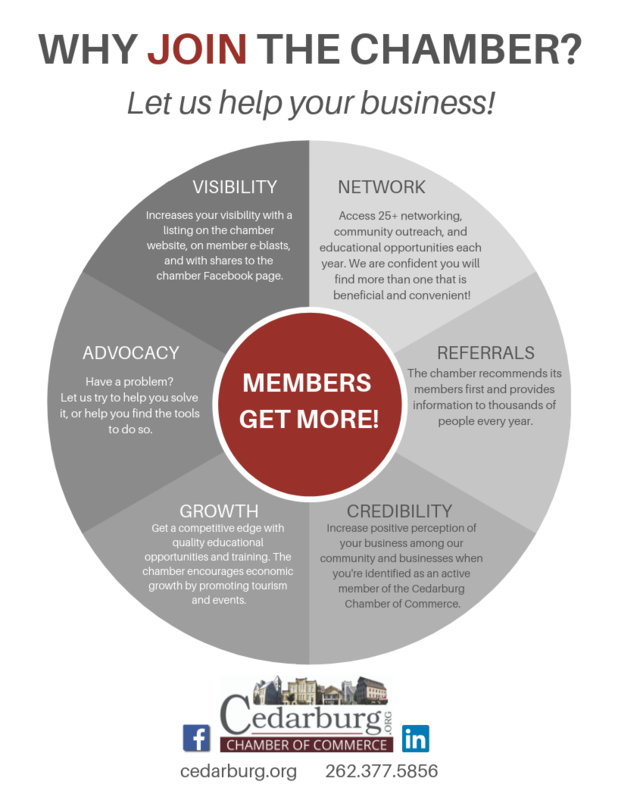 Partner with us at the Cedarburg Chamber of Commerce, and we will do everything we can to help your business succeed! Member Advocacy - have a problem? Let us try to help you solve it, or help you find the tools to do so. Gift Check Program - as a member, your business can accept the thousands of dollars we sell in Cedarburg Gift Checks each year! Free Ribbon Cuttings - grand opening or other anniversary ribbon cuttings are available - all designed to help your business shine! a tailored membership - we want to meet your needs and do our best to help you succeed and grow! Play an important role in the Cedarburg business community. Join the Cedarburg Chamber of Commerce today! Have questions? Contact Maggie Dobson at director@cedarburg.org or (262) 377-5856.